Children’s book author Ruth Sanderson’s heart beats to the drum of horse hooves. In the 1980s she illustrated the covers of the Black Stallion books. These days, she illustrates Random House’s Horse Diaries series – terrific horse stories and illustrations for young readers. 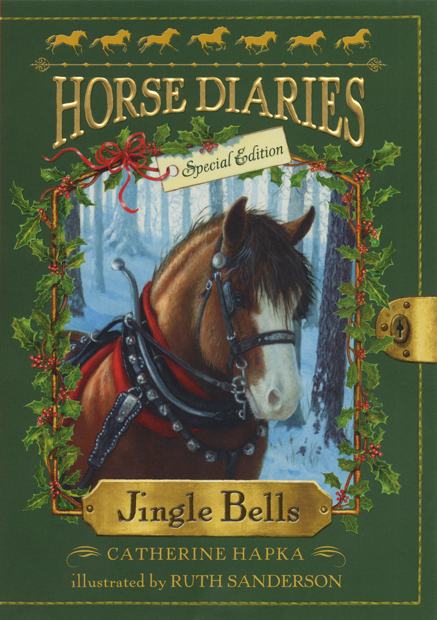 Her latest book, Jingle Bells, came our recently. 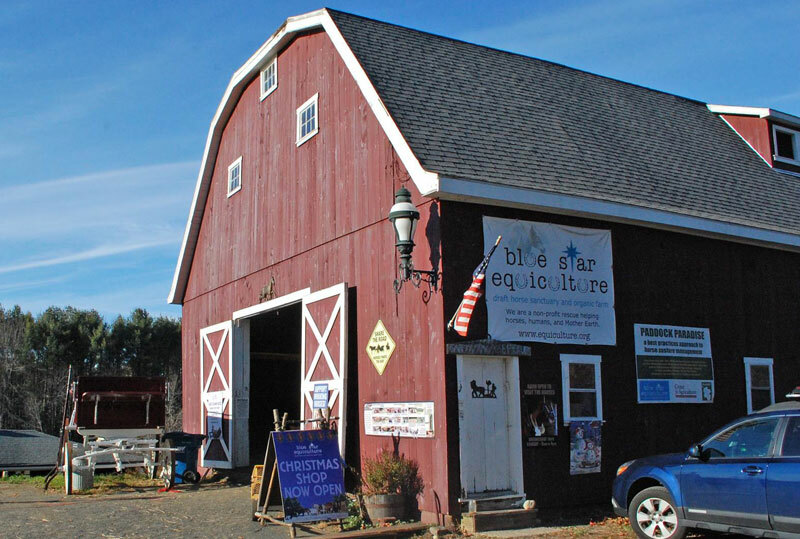 Her inspiration for illustrating the big draft horse who is the star of the book came from visits to a draft horse rescue near her – Blue Star Equiculture in Palmer, Massachusetts. Here’s what else Ruth had to say about her latest project and the creation of its wonderful artwork. What was your connection with Clydesdales before the story? 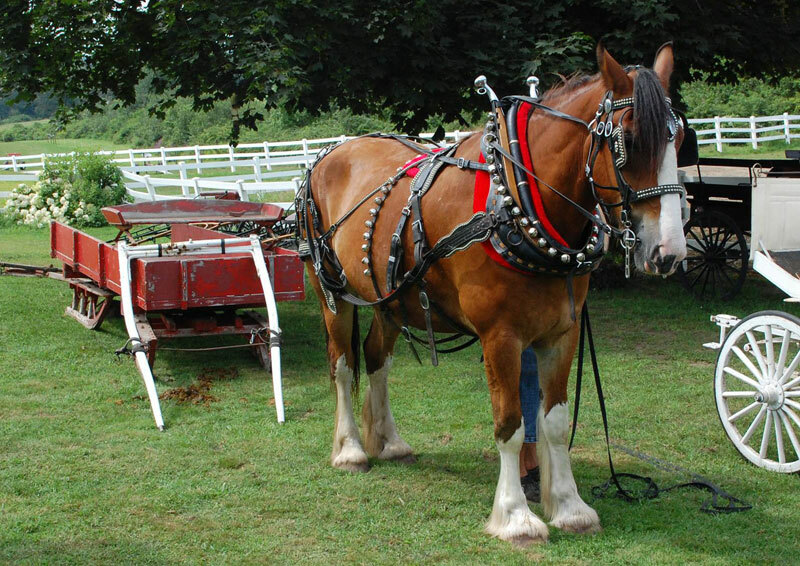 I am certainly familiar with the Clydesdale – The Anheuser Busch Company has certainly made them universally famous with the Budweiser Clydesdale commercials. I have also been a horse lover for my entire life and have read lots of breed books as well, was in 4-H, raised two daughters who both had horses in 4-H.
What did you learn about the breed through the process of creating these illustrations? Unlike Belgians which I have observed to sometimes be a bit on the “hot” side, the Clydesdale seems to be very patient, steady, and hard working. 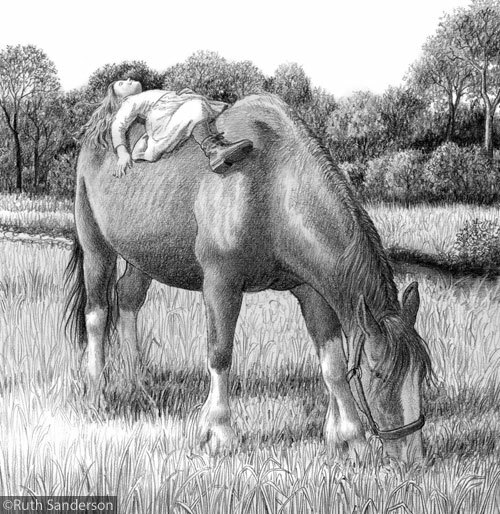 The girl model for the story had never been on a horse before, and she was so comfortable with him she was able to lie down on his back and look up at the clouds for one of the reference photos I used to create an illustration for the book. This horse was only about 4 years old and had barely been ridden, and he was such a good boy, it was amazing. I wanted to take him home. What’s your favorite thing about this book? 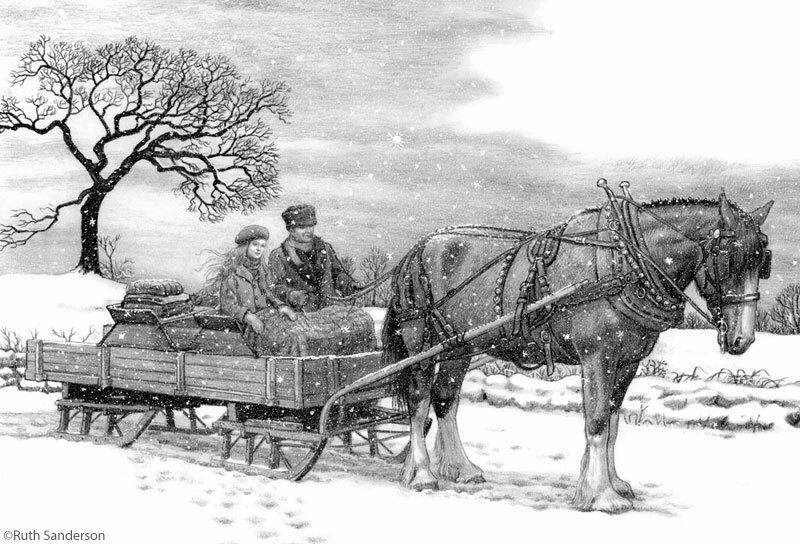 I enjoyed the part in the story where the horse and sleigh had to come to the rescue on Christmas Eve when the new-fangled Model-T got stuck in a ditch in a snowstorm. It was really fun to illustrate the snow scenes. This “special edition” is also extra-long and has holiday cookie recipes, and a “How to draw Jingle Bells” section. I have always wanted to create a “How to Draw Horses” book so this gave me a chance to do a few drawing demonstrations for the back matter of the book. What’s your favorite illustration and why? It’s a toss-up between one of the snow scenes, and the one of the girl lying down on the horse’s back. What can you tell me about your process? The front and back cover are oil paintings. The interior illustrations are all pencil drawings, with the addition of opaque white gouache [note: that’s a heavier paint than watercolor} that is spattered with a toothbrush to create snow! To learn more about Ruth and her artwork, check out her blog, her website, and her Facebook page. I love those pencil drawing…my Dad would always draw me horse pictures, and they looked just like them. Thank You!! My daughter just finished reading this book last night. Thank you for your beautiful work in this series. It keeps children reading and loving horses.